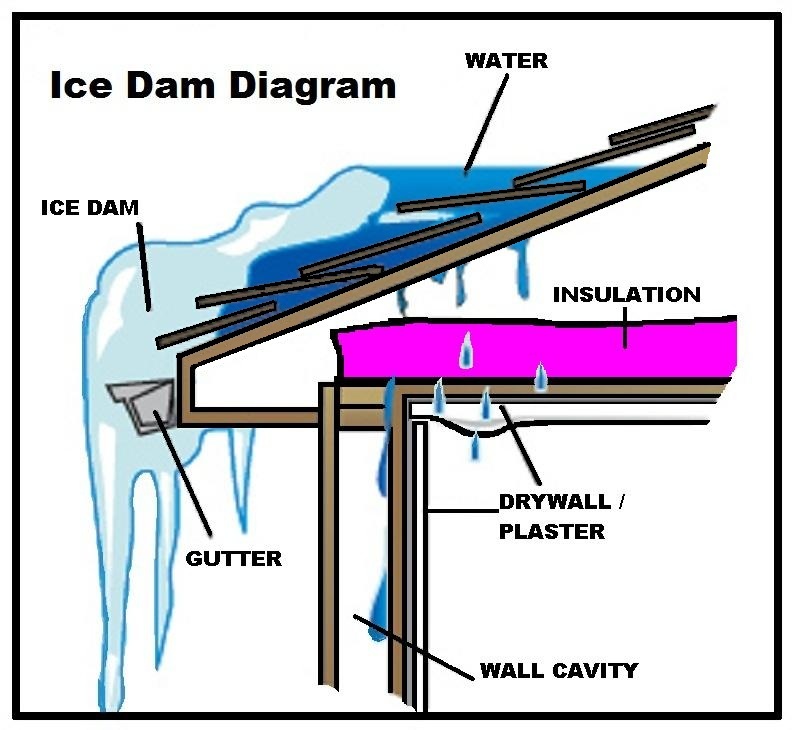 An ice dam is a block of ice that forms on the edge of your roof and traps melting snow and water from falling into your gutter and safely draining away from your property. The water that backs up behind an ice dam can infiltrate your property and cause extensive damage to your interior walls, insulation, ceilings, and other areas and will require immediate attention to avoid future mold and mildew growth. Ice dams are caused by a combination of freezing exterior temperatures and sustained variance in the surface temperatures of your roof when snow is present. Naturally, melting will occur when the surface area of your roof is greater than 32 degrees, and likewise, freezing will occur with surface temperatures at or below 32 degrees. 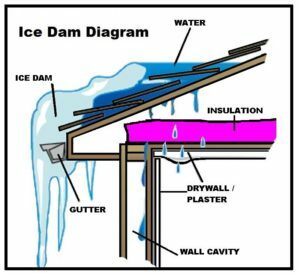 Ice dams are created when the lower sections of your roof sustain freezing conditions when sections above promote melting. Poor Attic Insulation – As warm air rises, any leaking air from your living space can transfer to your roofing materials. Exhaust Systems – Exhaust systems that exit above the roof line can produce heat and promote melting. Chimneys – Heat transfer from chimneys can also warm attic space. How To Deal With Ice Dams? Most property owners won’t notice they have a problem until it’s too late, so some actions may need to be taken in the moment. Remove Snow From Your Roof: The weight of large amounts of snow can create problems of its own for your structure. However, removal of excess snow in the first place will help you eliminate one of the key elements needed to create an ice dam. You can use a broom or a roof rake for removal, but be sure to use extreme caution. Clear Ice Build Up From Your Gutters: In situations where you have noticed water flowing into your property, you may need to remove ice build up or create channels for excess water to drain from your roof. ** Note: Working on your roof in colder temperatures creates pressure on materials that may be increasingly brittle. 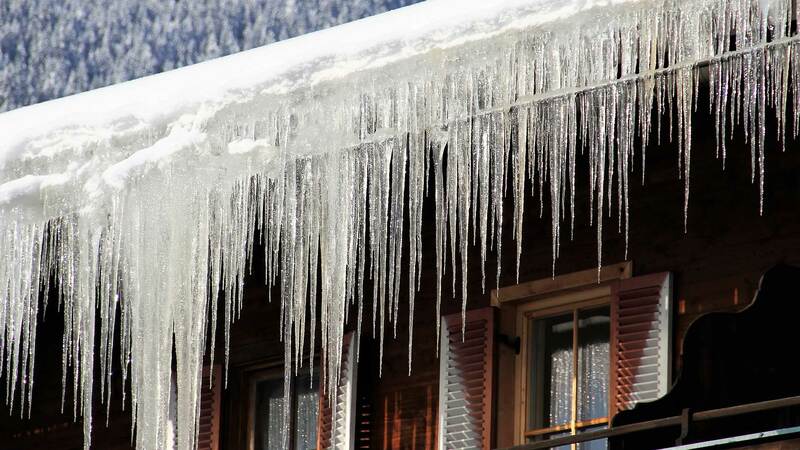 It’s best practice to prevent ice dams from happening in the first place. The best way to prevent ice dams and limit your risk for property damage is by improving insulation and limiting all moist and warm air leaking into your attic. Mammoth’s professional technicians are available around the clock to help you with any property damage.